THE PEAKS RESORT AND SPA LOCATED IN TELLURIDES MOUNTAIN VILLAGE OFFERS LUXURY HOTEL AND RESIDENTIAL VACATION ACCOMMODATIONS TO SUIT YOUR NEEDS RANGING FROM MODERN ROOMS-SPACIOUS SUITES-RUSTIC YET LUXURIOUS CABINS-EXQUISITE CONDOS-AND STUNNING PENTHOUSES. 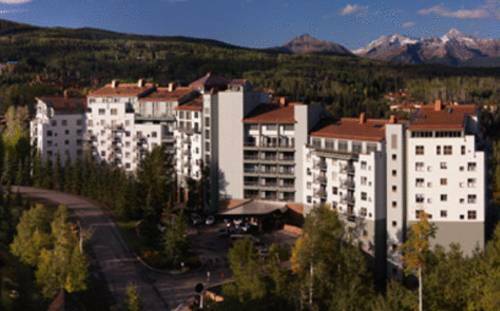 NESTLED AMONG THE STUNNING SAN JUAN MOUNTAIN RANGE ENJOY SKIING-HIKING-BIKING-GONDOLA RIDES AND MORE AMONG THE PRISTINE BEAUTY AND BREATHTAKING SCENERY OF TELLURIDE. ENJOY SKI-IN/SKI-OUT ACCESS TO TELLURIDE SKI RESORT. TELLURIDE SKI RESORT IS KNOWN FOR ITS WORLD-CLASS SKIING WHILE PROVIDING CHALLENGING RUNS FOR THE ADVANCED AND ENJOYABLE GROOMED TERRAIN FOR THOSE JUST BEGINNING. THE SPA AT THE PEAKS RESORT BLENDS A WELCOMING AMBIENCE WITH A FRESH - MODERN ATTITUDE AND REJUVENATING SERVICES INSPIRED BY THE SPLENDOR OF ITS SETTING. AFTER A LONG DAY OF ADVENTURE ENJOY A LIBATION AND UNWIND IN THE GREAT ROOM FEATURING A MASSIVE FIREPLACE - OVERSIZED CLUB CHAIRS - RICH LODGE-STYLE FURNITURE AND LIVE MUSIC. IN THE SUMMER MONTHS TAKE ADVANTAGE OF THE DEEP END POOL CLUB PROVIDING A RELAXING AND SUNNY PLACE TO ENJOY DRINKS - SANDWICHES AND APPETIZERS. INCREDIBLE PANORAMIC VIEWS AND EXCEPTIONAL SERVICE - ALL AT A CONVENIENCE FOR POOLSIDE LOUNGING. OUR SIGNATURE RESTAURANT - THE PALMYRA - FEATURES INNOVATIVE CUISINE BLENDING ORGANIC REGIONAL INGREDIENTS WITH INTERNATIONAL FLAVORS. MAGNIFICENT VIEWS CREATE AN UNFORGETTABLE DINING EXPERIENCE. THE PEAKS RESORT AND SPA IS COMMITTED TO DELIVERING UNIQUE - PREMIUM - ONCE IN A LIFETIME MEMORIES TO OUR GUESTS.